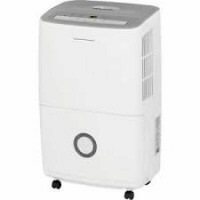 The Frigidaire Dehumidifier is one of the most popular models in the USA. Whether we talk about the 70 pint, 50 pint or 30 pint models these are among the strongest contenders for the title of "Best in Class" on the US market. Although not outstanding in any one area these units are good performers across the whole range of measures we use when writing reviews of these appliances. 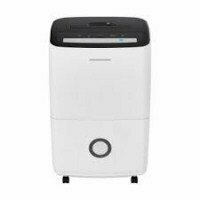 The Frigidaire Dehumidifier is not specifically designed for use in a basement but all three models are popular as basement dehumidifiers. Many hundreds of reviews have been written about the effectiveness of the Frigidaire Dehumidifier in controlling basement dampness and eliminating those unwelcome musty smells. All the models in the Frigidaire range are Energy Star® qualified and are widely available from major stores and home improvement centres for in-store purchase or web shopping. The Frigidaire FFAD7033R1 is the latest 70 pint model from Frigidaire. An increasing number of favorable reviews of the FFAD7033R1 suggest that this model will be very popular. The Frigidaire FFAD7033R1 is an Energy Star® compliant 70 pint unit with the capacity to control humidity in a typically sized basement with a normal temperature of 65°F or higher. 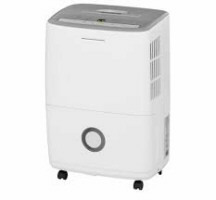 The features of the FFAD7033R1 are similar to those of rival dehumidifier models but include auto-restart (after a power outage) which is absent from one or two other popular brands. The Frigidaire FFAP7033T1 70 Pint Dehumidifier with Pump is identical to the FFAD7033R1 except for the addition of an integral condensate pump. This feature allows continuous drainage to an outlet at a far greater horizontal distance from the appliance than a gravity feed could cope with, or to an outlet on the floor above that on which the dehumidifier is located. This is a first for Frigidaire and reflects the popularity of this feature which has been absent from Frigidaire models up until now. If an integral pump is a must for you, and you are prepared to pay the additional cost, this is the model for you. The Frigidaire FFAD5033R1 is a new model from Frigidaire. The FFAD5033R1 is very well liked by users and is widely used in small to medium sized basements. I have included the FFAD5033R1 on my list of the top portable models for many reasons, not least the enthusiastic reviews written by its users. The FFAD3033R1 is a lower capacity portable model from Frigidaire. TheFFAD3033R1 is a new 30 pint unit. So far there are relatively few consumer reviews of this model but these are very positive. The Frigidaire FFAD3033R1 is Energy Star® qualified and more energy efficient some earlier models. The FFAD3033R1 is easy to use with all the essential features you would expect. Before the introduction of the collection of four models introduced earlier on this page the Frigidaire dehumidifier range contained the following appliances which are introduced below. 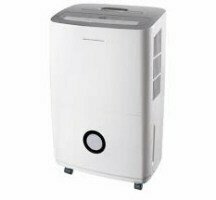 The models are still widely available for sale and ar well worth considering by anyone looking to purchase a dehumidifier. The FAD954DWD is a large capacity 95 pint appliance suitable for larger basements. It has not been sold in large numbers but the reviews that have been written are largely positive. This model is not suitable for use in very cold conditions but will perform well in a basement at comfortable room temperatures. It is important to note that the FAD954DWD is not Energy Star® qualified. 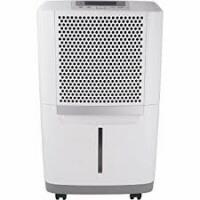 The Frigidaire FAD704DWD 70 pint dehumidifier is a high capacity unit principally used in basements. Reviews for this model are plentiful and overwhelmingly positive. It is as capable as its replacement, the FFAD7033R1, but with slight differences; e.g. a two speed rather than a three speed fan. The FAD704DWD is Energy Star® qualified and remains an attractive buy for dehumidifier users. 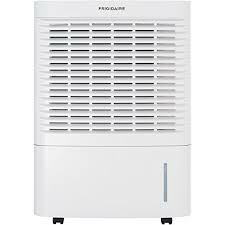 The Frigidaire FAD504DWD 50 pint dehumidifier is a medium capacity unit suitable for basements of up to 800 square feet. This model has proved particularly popular with users with a high number of 5 star reviews. It is reported to be relatively quiet, a quality which has contributed to its success with consumers. The FAD504DWD is Energy Star® qualified and is still being purchased in significant numbers. 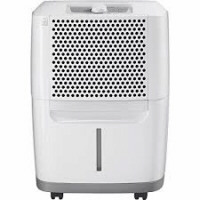 The Frigidaire FAD301NWD 30 Pint Dehumidifier is a low capacity unit designed for areas of up to 400 square feet. Users are very impressed with this model which they praise as effective and quiet. Applications include rooms in the house, such a a bedroom or laundry room, RVs and trailers. This Energy Star® qualified appliance is still available for sale and remains as popular as ever. Earlier models from Frigidaire may still be available from some retailers. If you are thinking about buying one of these, or already own one and want more information, you will find my review for each model by following the links below. Frigidaire is a household name but for those who would like to know a little more about the company that markets these appliances here is some background information. The Frigidaire Dehumidifier is a well known and respected product but the company that that created the brand was originally founded as the Guardian Refrigerator Company, famous for developing the first self contained refrigerator. There is a strand of continuity between the company's origins and its association with, among many other products, the dehumidifier. Refrigerant models, the most common type used in the home, incorporate a good deal of the technology first developed for the refrigerator. The name "Frigidaire" was adopted in 1919 when the company was acquired by General Motors who owned it for sixty years. After a brief spell as part of White Consolidated Industries the company was bought by Electrolux, its current parent. For many years the company was best known for washing machines but among its achievements was the introduction of the first room air conditioner, another link with the Frigidaire Dehumidifier.